Schedule your wordpress post is very useful feature in wordpress. why would you want to do this? If you have 2 or 3 articles and don’t want to publish all posts on the same time or republish your old posts or on vacation. 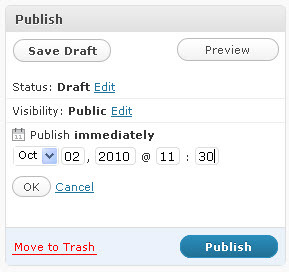 It is simple to schedule your posts to publish in the future in wordpress. 1.Login to your wordpress admin. 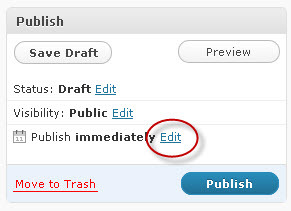 2.Click Add New to write a post. 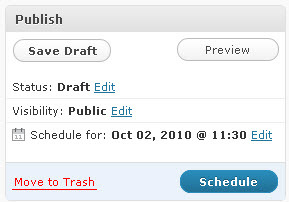 4.Set your future date and time and press Ok.
5.Now click the schedule button. Note: If your are using XML-sitemap plugin then this will affect your google search indexing feature of your site.when your schedule the post it(plugin) will notify the google but when google search your site it will not find the post.